Flamingo Reviews - Ideal for Women’s Shaving Needs? Flamingo combines German-design and Spanish wax kits to provide a unique shaving and waxing experience for its customers. We'll examine the claims and help you decide whether this is for you. Flamingo is a hair removal brand redesigned to fit the varying needs of women by offering a pivoting 5-blade razor and/or ready-to-use gel wax strips convenient to use while traveling or in the privacy of your bathroom. Flamingo was born on the basis that women have different shaving needs than men, and therefore should be offered a high-quality alternative, along with other options, such as waxing. The company is trademarked under Harry’s Shave Club, which has provided shaving tools for men since 2013. However, the Flamingo website states that “over a million women have used and loved the products” by Harry’s. This prompted the women working for the brand to come up with a razor specifically designed for the way women shave and other items to help remove hair. The name “Flamingo” is derived from the pose a woman makes when shaving in the shower, with one leg up. Let’s examine more closely how Flamingo removes hair and if the results are the same as a good-quality shaver and/or easy-to-use wax experience for a decent price. The razor is “German-engineered” and employs a unique hinge which conforms to curved areas like the knees and underarms, while a comfortably weighted handle gives an easy yet firm grip. The razor uses five blades to get a close shave, while a strip of aloe vera leaves the skin hydrated. Flamingo’s foaming gel, which also contains aloe vera, enhances the shave by conditioning the skin, so it’s left smooth after a shave instead of taut and flaky. Following the shave, you can use Flamingo’s exfoliating daily lotion, with white willow bark, which claims to maintain an even skin appearance. There are also two different packages for waxing. One is for your body and targets larger areas like the legs and underarms. The second is a face kit, which uses smaller strips to remove hair from the upper lip and sensitive areas like your bikini line. The wax is a “unique, first-to-the-U.S. formula” that “removes the finest, shortest, and spikiest of hairs,” the Flamingo website says, and is 1.5 millimeters thick, or about as thick as a quarter. The wax kit also claims up to four weeks of continuing results. The razor is made to be used in the shower, and the wax strips can be used directly from the packaging, giving you the choice that is suitable for you at any time. As we researched Flamingo’s products, we wanted to explore their claims that their blades are German engineered and their wax strips are “unique”. When it comes to the blades used in their razors, Flamingo employs engineers with nearly a century of blade-making skills to produce the blades. The steel itself come from Sweden, while the blades used on the razors come from the Harry’s factory in Germany. We were able to contact a company representative to ask about the gel formula used in the wax strips. How Much Does Flamingo Cost? A Flamingo Shave Set bought directly from the website, costs $16, while both the Face Wax Kit and Body Wax Kit cost $10. The razors are also available at Target, which is something we’ll address at the end of this review. 1 foaming shave gel: 1 oz. 1 body lotion: 3 oz. Three options for the razor handles come in the following colors: taro & rose gold; mint & gold, and pomelo and silver. If you need a refill of any of the products, they are also sold separately. Additional blades cost $2 each and come in packs of four, eight, or 16. Shipping costs $3 with orders under $10 and is free if your purchase is $10 or more. The company also has a 30-day full refund policy if you are not pleased with the products. There are more than a few options when it comes to competing razors available for women. A common option nowadays is the subscription model, where whatever you order comes directly to your front door at a recurring time that you choose. Billie is a new subscription-based company for women’s razors that claims its razors are half the cost of competing brands. The website presents the brand as sleek, colorful and fun with razors that are “built for womankind.” The brand promotes that it celebrates women in their hairless or hairy state, and everything in-between. magnetic shower holder, and two 5-blade razor cartridges. You then choose how often they’ll send you your five blade cartridges, which always comes in a pack of four. Billie's also has a range of body products that are labeled vegan, non-GMO and gluten-free. This includes a body lotion, shaving cream and body wash made without parabens, sulfates, or synthetic fragrances. It says that its ingredients are natural, including: shea butter, aloe vera, rose canina and grapefruit. The reviews are almost non-existent, at the time of writing, since you’re only able to buy Billie’s razors directly through their website. Companies and individuals alike highly praise the razor and Billie’s other products directly on the website’s reviews tab. Another well-known-brand option would be Gillette’s Venus Platinum Extra Smooth Women’s Razor, that is also made with five blades, where the handle is made out of solid metal for stability and to make it more “elegant,” the website says. Venus claims this razor will offer an “extra smooth” shave, where a “water-activated” strip around the blade protects the skin from being pulled on, which can result in unwanted cuts. The website offers a subscription plan with various pricing for handle types and blade types. If you choose the above model it comes out to around $19, with free shipping, plus an extra four blades cost $17, with options for how frequently you would like to receive new blades. Alternatively, you can also purchase the Gillette Venus Platinum Extra Smooth Women’s Razor, without a subscription, directly through Amazon.com, where a handle and 2 blades currently cost $10.99 or on Walmart.com where a handle and 2 blades currently cost $12.97. 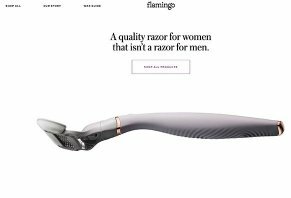 Both the Billie razor and Gillette Venus appeal to the subscription-based model, which is the primary difference with Flamingo. Gillette Venus has been around for a long time, while Billie is a very new company specifically targeted towards women. A couple of factors to consider when deciding to buy either the Flamingo, Billie or Gillette Venus would be: cost and what’s included starter-kit items. Breaking down cost starting with Gillette at $19, making it the most expensive and only providing the razor handle and one cartridge. The next option would be Billie’s starter kit, at $9, which adds a magnetic holder for the shaver, the handle, as well as two cartridges. Flamingo ranks in the middle of the three, at $16, and offers a shave gel, lotion, shower hook, and travel pouch on top of the razor handle and two cartridges. When considering the various options and needs that you might have, it seems that Flamingo can offer more than its competitors by offering extra quality products at a reasonable price. An added bonus of Flamingo is the waxing options it provides for convenience and/or a diversity of locations on the body. As we looked at Flamingo and how it caters to the needs of women when it comes to removing hair, it is clear that this new brand is a strong contender in the world of razors and waxing products. Flamingo seems to have created quality tools and a selection of natural products to help with the basic hair removal process and make it more enjoyable. The simple, functionally designed razor, redefined from the popular design that Harry’s uses, gives it a more feminine appeal. And, the option for using waxing strips when needed, gives it the edge over the Billie and Gillette Venus. However, Flamingo does not currently offer a subscription service. Overall, when looking for quality, alternative razors at cost-friendly rates, Flamingo can be a great option for you to try. Additionally, their waxing kits may be the right way to go for touch-ups or when wanting to achieve longer lasting results. Also, like Harry’s razors, you can buy Flamingo products at Target either online or in-store Target shoppers to pick up the razors and wax kits locally or place an order online. A few recent Target reviewers called the Flamingo razor “good and sturdy,” “affordable,” and “a new favorite,” with an overall rating of four stars. If you are the kind of person who has a variety of needs when it comes to removing hair, the products Flamingo sells can give you the options you’re looking for, from a simple shave to waxing with very specific detail. Write a Review for Flamingo!